” http://www.vladtv.com – A man from Ireland was jailed and embarrassed after he knocked himself out with a brick during a failed carjacking attempt. According to the Huffington Post, Gerry Brady talked to reporters about the incident when he found the man knocked out near his vehicle. Brady, who owns the local bar nearby says he watched the culprit attempt to break into his car several times. After a rock didn’t break the window, he tries to use a brick and knocks himself out. Brady says the suspect tried to tell the police he was the one who injured him, but they discovered his own actions caused the entire thing. ” Two police officers in Philadelphia have been charged with beating a man nearly two years ago and claiming that he attacked them, authorities said this week. The charges, which come amid a heightened focus on police tactics in the country, came as a result of surveillance footage showing that the officers, rather than being assaulted as they had reported, knocked the man off a motor scooter before beating him so severely he required stitches and staples, according to a grand jury report, the Philadelphia district attorney and the city’s police commissioner. The surveillance video showed the police car, without its lights or siren activated and not issuing any commands, hitting Rivera on his scooter and knocking him onto the ground, according to the grand jury presentation. This video then shows the officers getting out of the car and hitting Rivera with a baton, first while being held against a wall and then while he was on the ground. In it’s typical Statist way the WaPost omits the fact that it was the determination and diligence of Mr Rivera’s girlfriend , Dina Scannapieco , that finally brought this case against the officers involved thanks to her tireless efforts to locate surveillance video of the incident , something that the authorities failed to do . 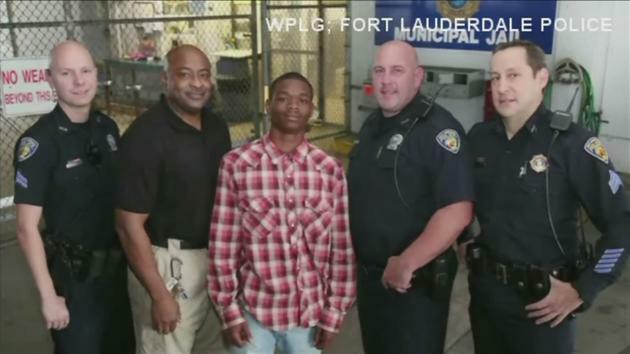 ” According to the Fort Lauderdale Police Department, on Sept. 10, 2014, Officer Franklin Foulks was in the process of booking 17-year-old Jamal Rutledge, when the cop collapsed. Rutledge, still in handcuffs, got up to check on Officer Foulks, who police say was losing consciousness. ” An Arizona county party official said he saw a man stuffing “hundreds” of ballots into the ballot box and later told a local news outlet the entire incident was caught on surveillance video. “ A person wearing a Citizens for a Better Arizona T-shirt dropped a large box of hundreds of early ballots on the table and started stuffing the ballot box as I watched in amazement,” said A.J. LaFaro, chairman of the Maricopa County Republican Party. LaFaro said it all happened as he was working with the elections staff during early ballots processing. The team in charge of processing the ballots got “way ahead” so the information systems coordinator convened an extended lunch period from 11:30- 1:00 p.m. While the Citizens For A Better Arizona organization bills itself as a collection of democrats , republicans and independents , a quick look at the bios of their board reveals a collection of lawyers , teachers and union representatives … do the math , but remember , vote fraud is a myth . ” Sgt. Andrew Tahmooressi is an innocent Marine who took took a wrong turn and accidentally crossed the Mexican border with guns in his car. There is no excuse for President Obama refusing to pick up the phone and demanding that Mexican authorities release him, immediately, which is why there have been numerous campaigns (see here and here) to urge Obama to do the right thing. Did The Oklahoma City Bomber Have Another Accomplice? ” One man’s quest to explain his brother’s mysterious jail cell death 19 years ago has rekindled long-dormant questions about whether others were involved in the 1995 Oklahoma City bombing. What some consider a far-flung conspiracy theory will be at the forefront during a trial set to begin Monday in Salt Lake City. The Freedom of Information Act lawsuit was brought by Salt Lake City attorney Jesse Trentadue against the FBI. ” Unsatisfied by the FBI’s previous explanations, U.S. District Judge Clark Waddoups has ordered the agency to explain why it can’t find videos from the bombing that are mentioned in evidence logs, citing the public importance of the tapes. Trentadue believes the presence of a second suspect in the truck explains why his brother, Kenneth Trentadue, was flown to Oklahoma several months after the bombing, where he died in a federal holding cell in what was labeled a suicide. His brother bore a striking resemblance to the police sketch that officials sent out after the bombing based on witness descriptions of the enigmatic suspect ‘John Doe No. 2,’ who was the same height, build and complexion. The suspect was never identified. ” Shocking surveillance camera video shows a Navy SEAL veteran being berated by his neighbor on his own porch while he tried to put away his stars and stripes. David Hall was a Navy SEAL for 21 years. In 2004 in Iraq, he tried to avoid a grenade, jumped off a roof and busted his knee so badly that he almost lost his leg. Now, Hall lives in Virginia Beach, where he admits he and his neighbor have been at odds since a dispute over the homeowner’s association a few years ago. But ever since, Hall says the verbal abuse has been relentless. Hall posted surveillance video to YouTube that shows his neighbor harassing him while he takes down his flag at sunset. The neighbor can be heard cursing at Hall and accusing him of “acting fat and laying around.” The neighbor says Hall is actually the bully. ” A New Hampshire store owner is starting to believe in the supernatural after she had a ghostly encounter in her store that was all caught on tape! The surveillance video from the Ellacoya Country Store in Gilford NH shows a glass tray thrown from the table after the employees leave the store. ” Family members have been arguing that it was a clear case of self-defense when a Huntington Station man shot and killed an alleged home burglar. But Youssef Abdel-Gawad has been charged with manslaughter, even though he said he was only trying to protect his family, WCBS 880 Long Island Bureau Chief Mike Xirinachs reported Tuesday. The family hopes surveillance video will clear their son, CBS 2’s Jennifer McLogan reported. We assume that because the suspects were put to flight before the fatal shot that the LI police are maintaining that the danger was past and thus the situation did not merit the discharge of the shotgun . Ok . But if that be the case then shouldn’t all police be suspect whenever they shoot a fleeing suspect ? According to the report , the DA doubts that the perp fired a shot but isn’t the presence of the gun reason enough for an act of self-defense ? Since when do the thugs have a right to the first shot for free ? When we were younger there was a policy (unwritten or official ?) that police could only shoot in self-defense or in the face of imminent peril for others . That no longer seems to be the case as we read all the time of cops shooting at perps in flight . If it’s ok for them then why not for civilians defending their homes and families ? Apparently the Supreme Court’s Tennessee v Gardner ruling in 1985 cleared the way for cops to shoot people in the back if the had committed a felony and if that is the justification for law enforcement , surely the civilian populace should be afforded the same rights , no ? Warning : If you are squeamish you might not want to watch as you can actually hear the young man’s arm break . ” A surveillance video shows two cops in Rotterdam, New York breaking the arm of a special needs 16-year-old while trying to remove him from a school bus. ” A police officer in Michigan put a young mother into a restraining chair and hacked off her hair weave. 7 Action News Investigator had exclusive video of the officer shoving Charda Gregory, restraining her, and then using scissors to cut out the artificial hair that was sewn into a braid on Gregory’s scalp. By the time she was brought in to the jail lock-up on the top floor of the Warren Police Department, Gregory had been pepper sprayed, but she appears calm. It’s clear in the video that Gregory can barely stand as she comes face to face with Officer Bernadette Najor. “ She took it upon herself to get the scissors. And for whatever reason, decided that she was going to butcher my client,” said Misukewicz. As Officer Najor pats Gregory down, the officer pushes Gregory against the wall twice. Suddenly Najor starts going for Gregory’s hair. The officers struggle with Gregory, dragging her over to a restraining chair to tie down her arms and legs. Officer Najor starts yanking Gregory’s head from side to side, chopping out chunks of hair. It takes 3 full minutes before Najor gives one final yank and removes what’s left of Gregory’s weave. This sort of thing is becoming a daily occurrence in Police State America … What ever happened to Tasers ? Thank God for video . Think of what these bastards had been getting away with all these years prior to the cell phone camera and home video surveillance becoming so commonplace . Another family loses it’s respect for authority .